1. 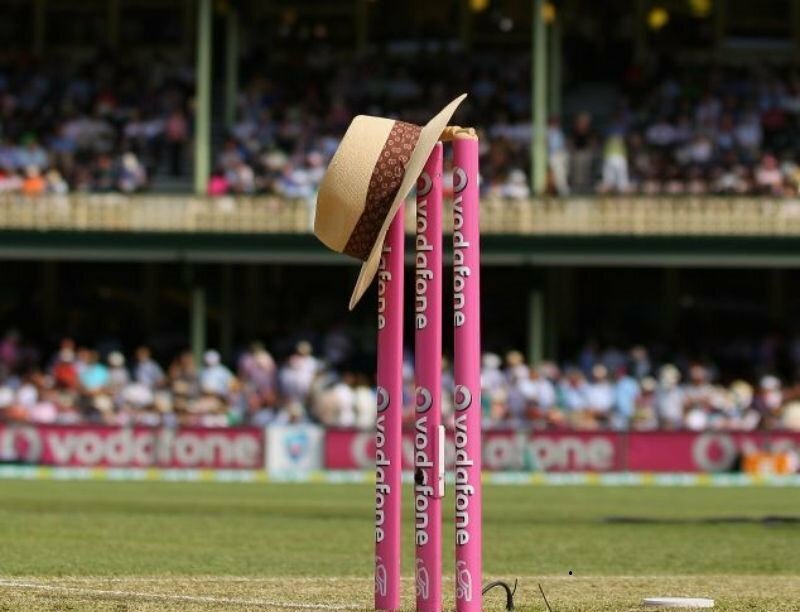 The Little Master walks out to bat one final time. Sachin in his last match against West Indies at the Wankhede Stadium, Mumbai. 2. 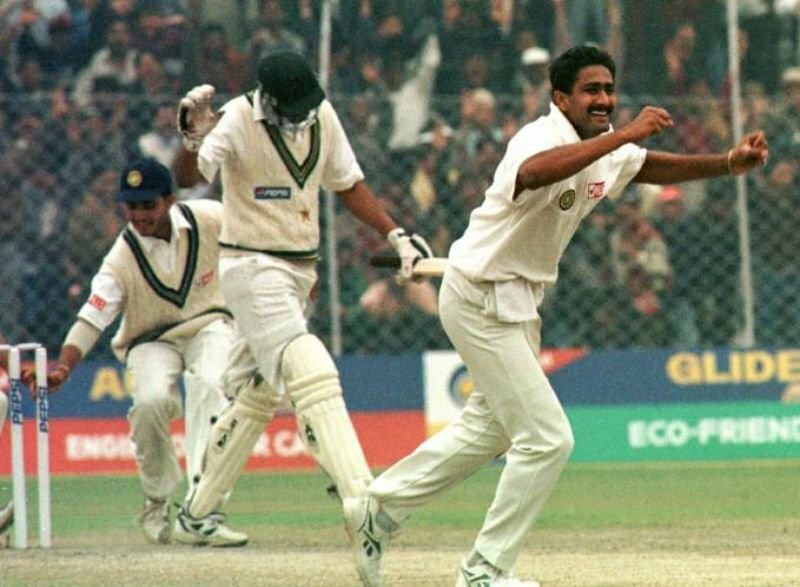 Anil Kumble's 10-wicket haul at Ferozshah Kotla. Kumble took all 10 wickets in one innings against Pakistan, leading India to victory and setting a world record. 3. 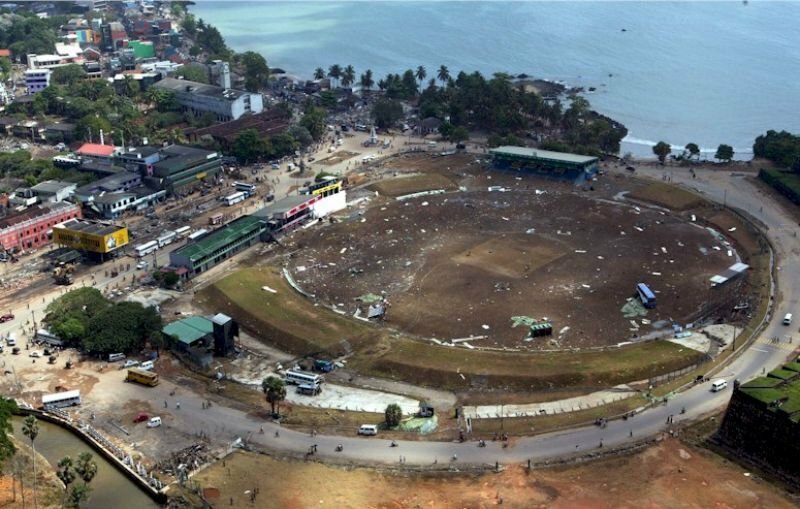 The beautiful Galle stadium in Sri Lanka wrecked after the tsumani hit. 4. Yuvraj Singh's iconic sixth six off Stuart Broad in one over. Yuvraj Singh hit 6 sixes in an over at the 2007 T20 World Cup against England right after an argument with Andrew Flintoff. 5. 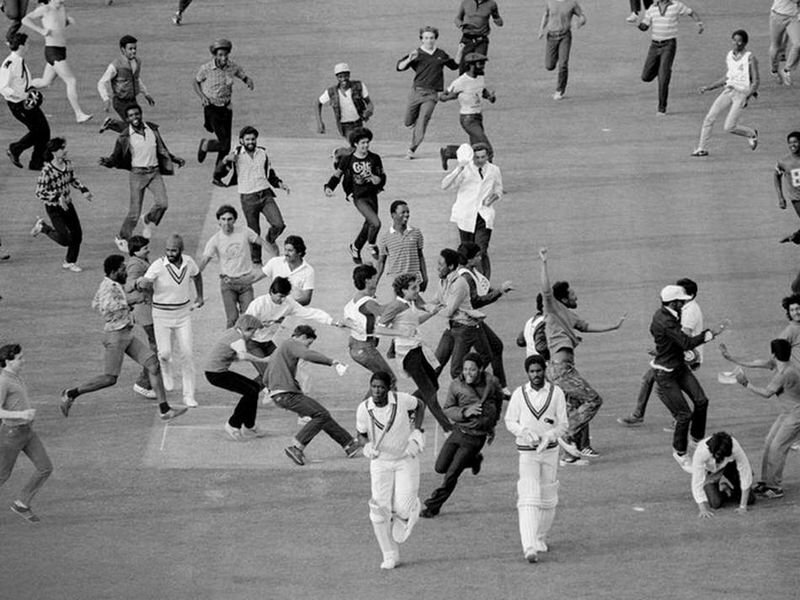 The moment when India won its first World Cup in 1983. After Jimmy Amarnath took the last West Indian wicket of Micheal Holding, the crowd rushed in. 6. Dada gives a fitting reply to Flintoff after India beat England at Lord's in the Natwest final. Flintoff had taken of his jersey in similar fashion 7 months ago after defeating India at the Wankhede, and Ganguly took the opportunity to repay the favour at Lord's as India chased down 326. 7. Bees attack the Ferozshah Kotla ground during a Test match between India and Australia. 8. 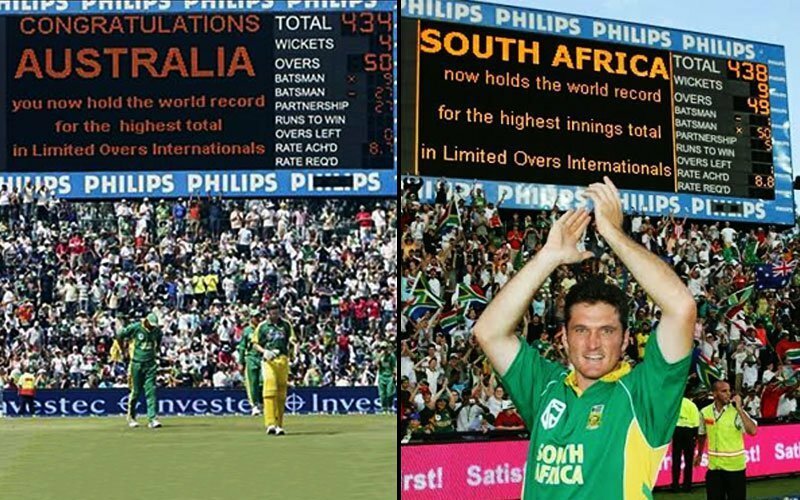 The day when Australia put on a record-breaking total and the Proteas chased it down. Australia put on a mammoth total of 434 but the real miracle happened when South Africa chased it down with 1 wicket and 1 over to spare. 9. 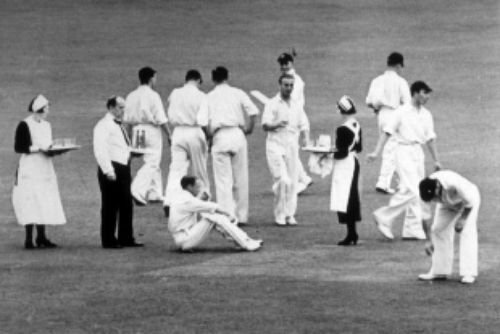 A tea break at Headingley in 1938. If this doesn't prove that it's an English game, what will? 10. A selfie of cricketing greats at the MCCs bicentennial celebration. 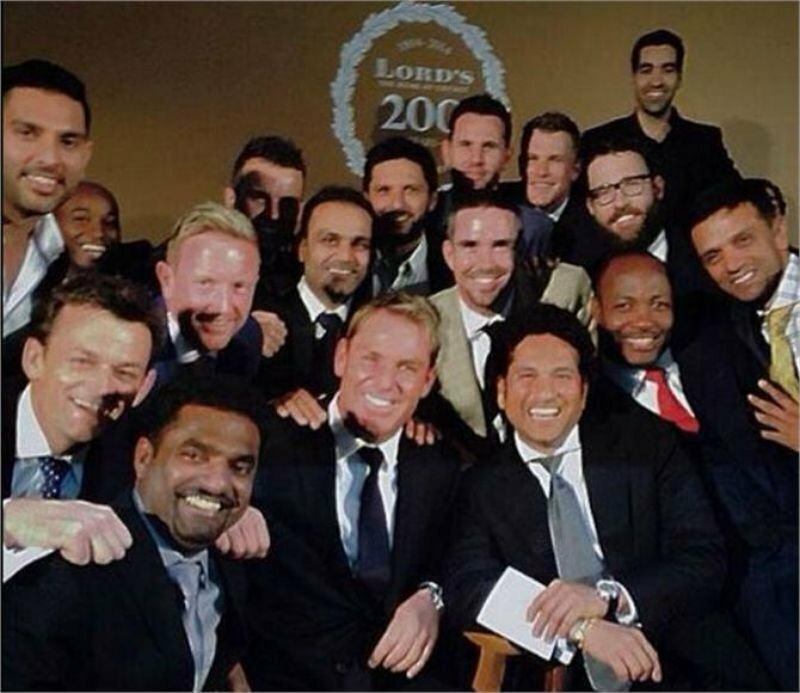 Lord's had completed 200 years and a match was scheduled with 22 legends of the game. Sachin and Warne captained the teams. 11. David Shepherd's famous hop, skip and jump at a full nelson. 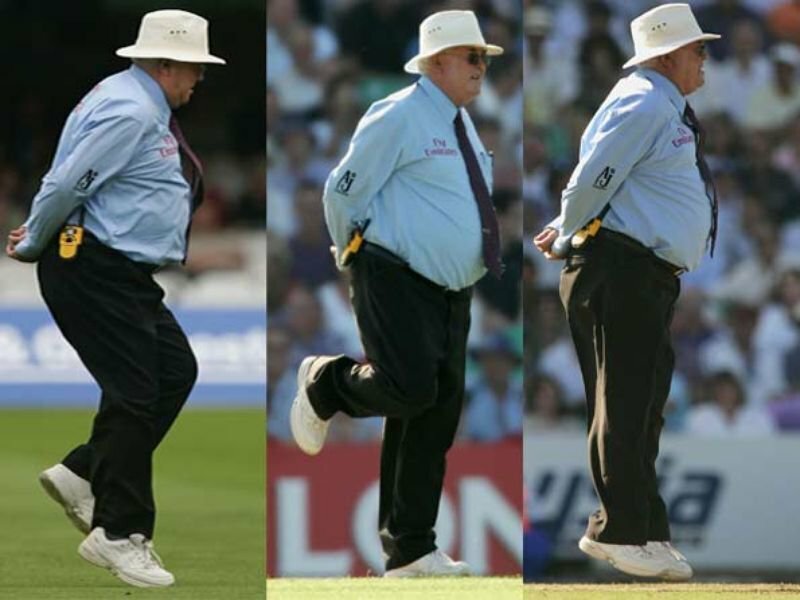 Whenever the score reached 111 or its multiples, David Shepherd performed his famous hop, skip and jump routine. 12. 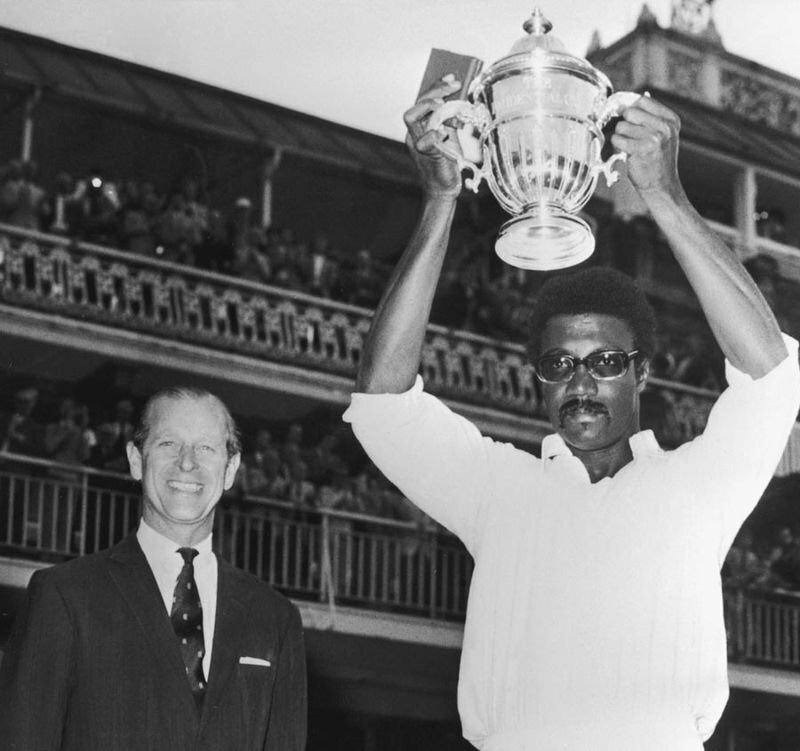 Clive Lloyd lifts the very first World Cup trophy after West Indies beat Australia in the final in 1975. 13. 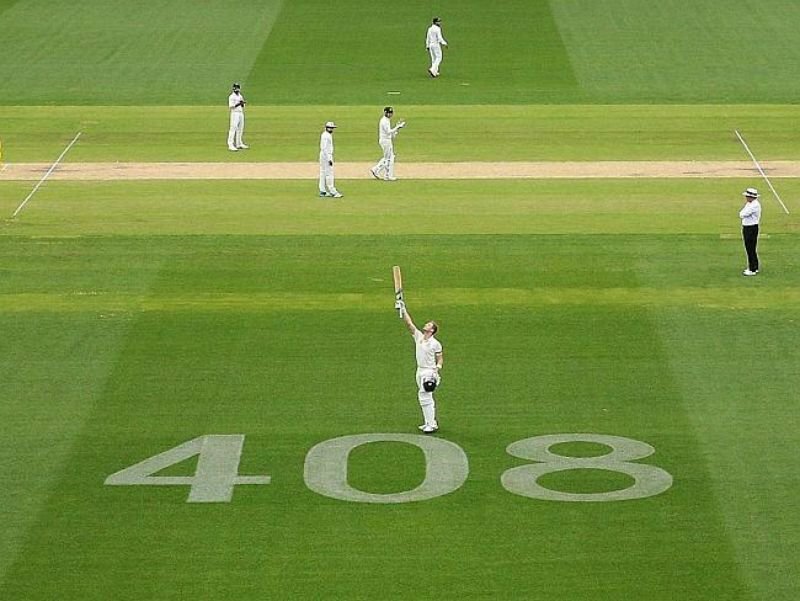 Steve Smith dedicates his century to the late Phil Hughes, who was Australia's 408th Test player. 14. 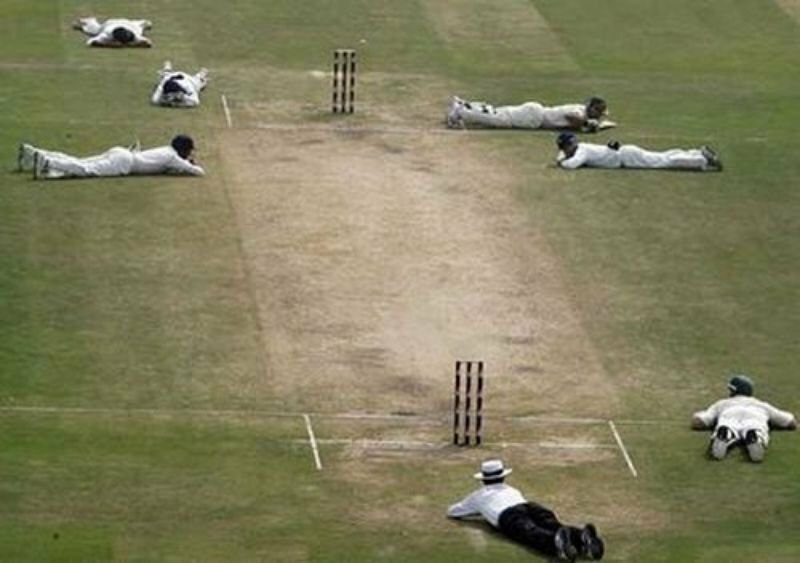 Trevor Chappell's underarm ball when New Zealand needed 6 off the last ball. 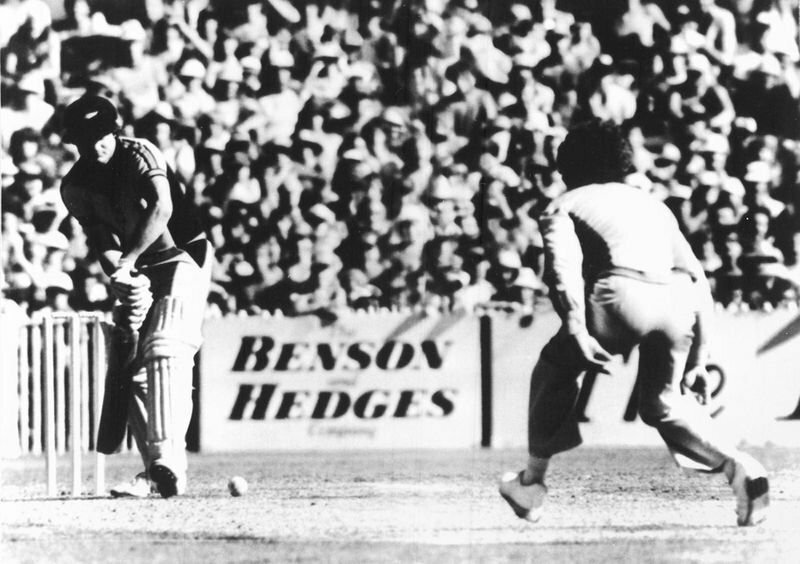 The Australian bowler was instructed by his captain and brother Greg Chappell to deliver an underarm ball to Brian McKechnie as the Kiwis needed 6 runs off 1 ball at the MCG in 1981. 15. 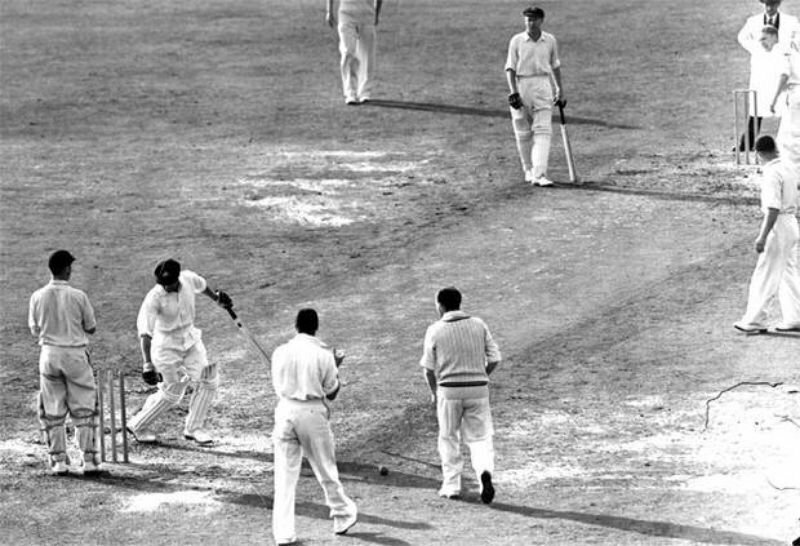 Sir Donald Bradman gets out for a duck in his final innings, failing to reach an average of 100. Don Bradman needed just 4 runs in his last match to reach an average of hundred but got out for a duck and retired with an average of 99.94. 16. 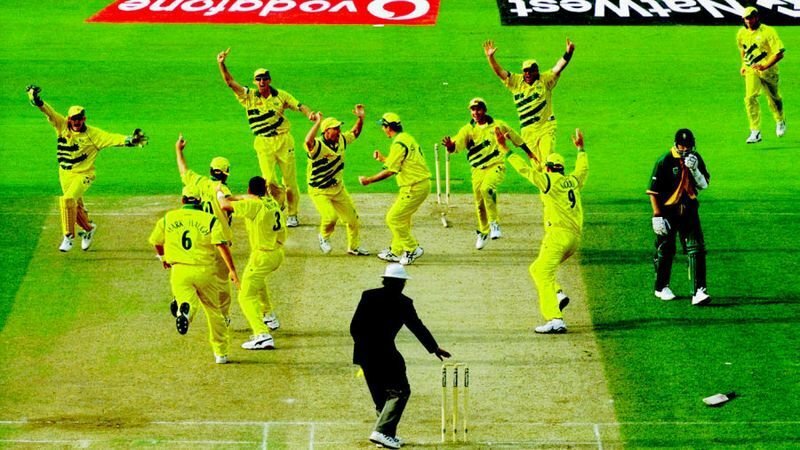 Alan Donald's diamond duck run out in the 1999 World Cup semi final. South Africa needed a run to win whereas a tie was sufficient for Australia to reach the finals. Donald did not listen to Klusener's call and ran late. 17. 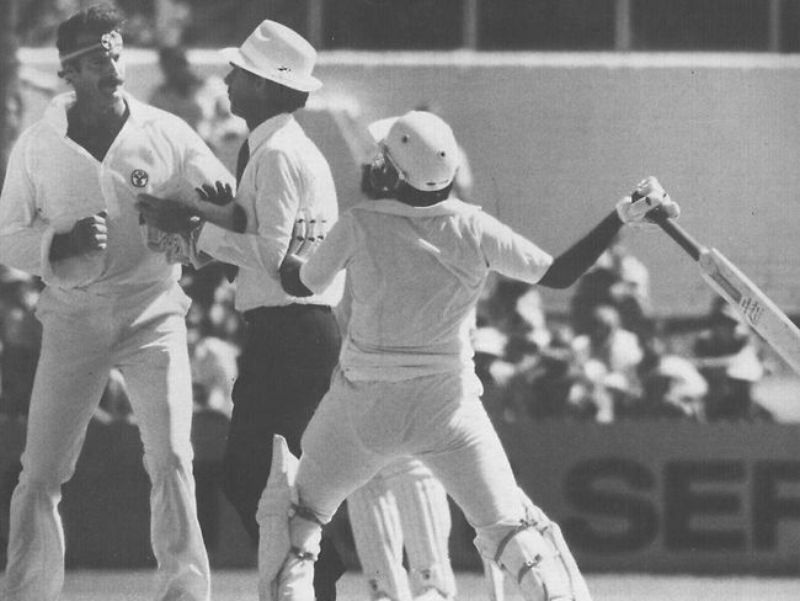 Javed Miandad raises his bat at Dennis Lilee during an argument. Miandad took a single off Lillee but the bowler stepped in his way leading to a small collision and later kicked Miandad as well. Miandad got angry and raised his bat. 18. Both West Indian batsmen were injured and needed runners. 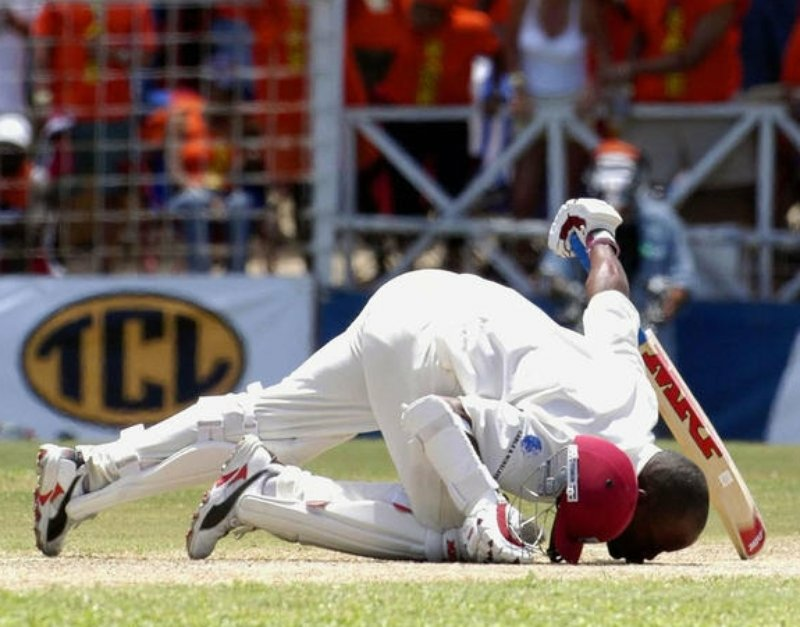 Both Shivanarine Chanderpaul and Ridley Jacobs got injured and needed runners. 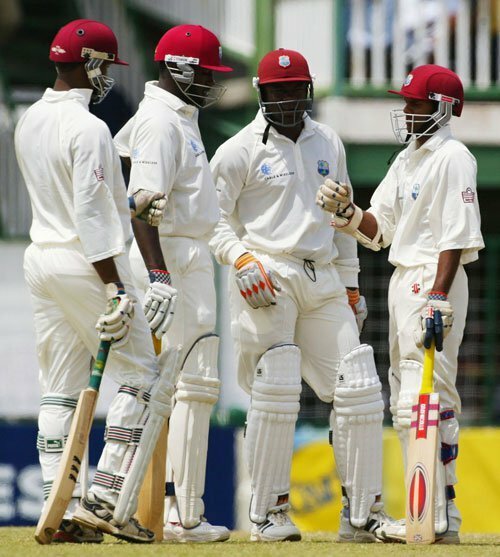 Marlon Samuels and Wavell Hinds came out to assist the batsmen but the partnership only lasted for 7 runs. 19. 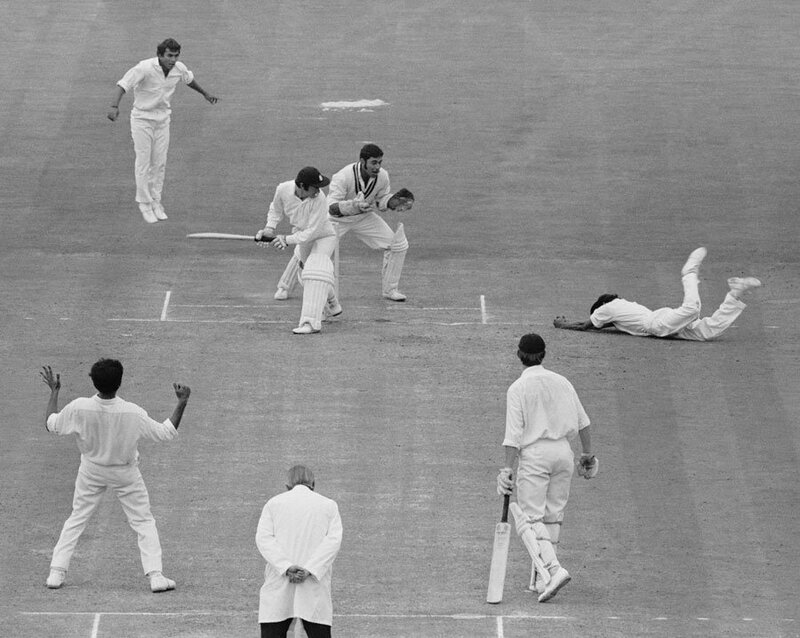 Dennis Lillee had 9 slips deployed vs New Zealand in 1977. 20. 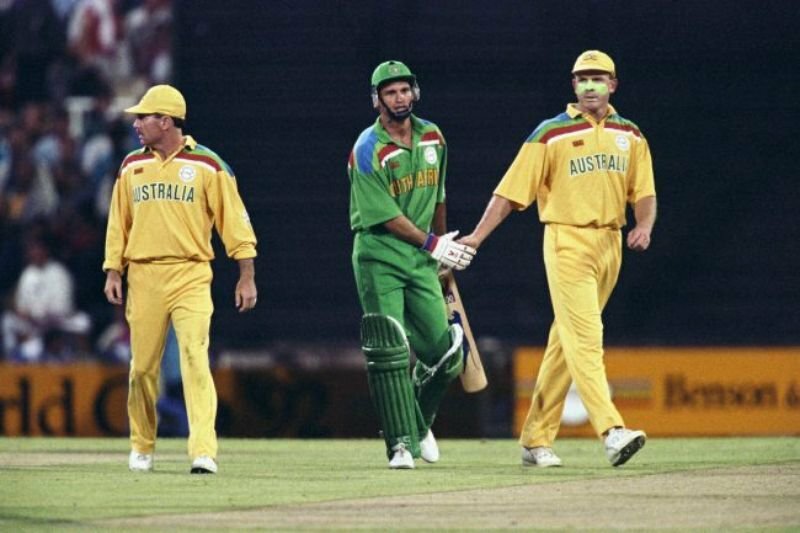 And the Aussies repeated it against Zimbabwe in an ODI at Harare in 1999. 22. 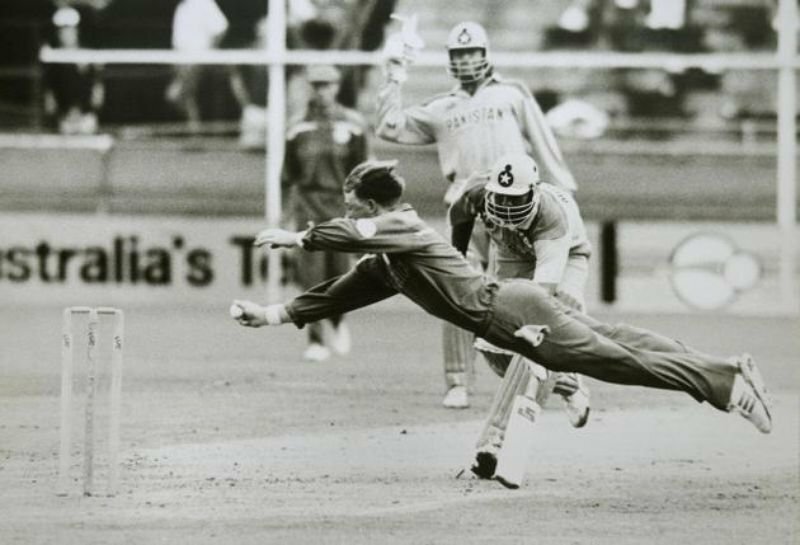 Jonty 'Superman' Rhodes dives to dislodge the stumps and run out Inzamam in the 1992 World Cup. 23. The God bids goodbye to the 22 yard strip that he worshipped. 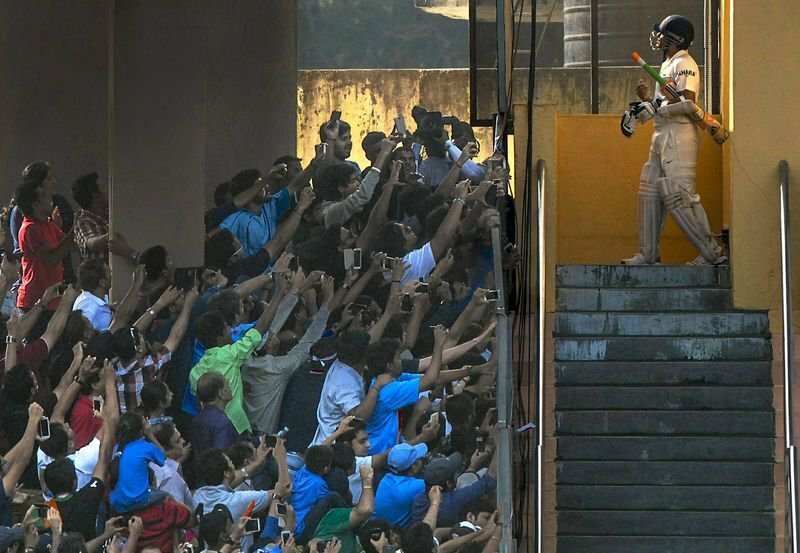 Sachin at the Wankhede Stadium, Mumbai, after his last Test match. 24. The Australian team in 2007 after winning the World Cup for the third time in a row. 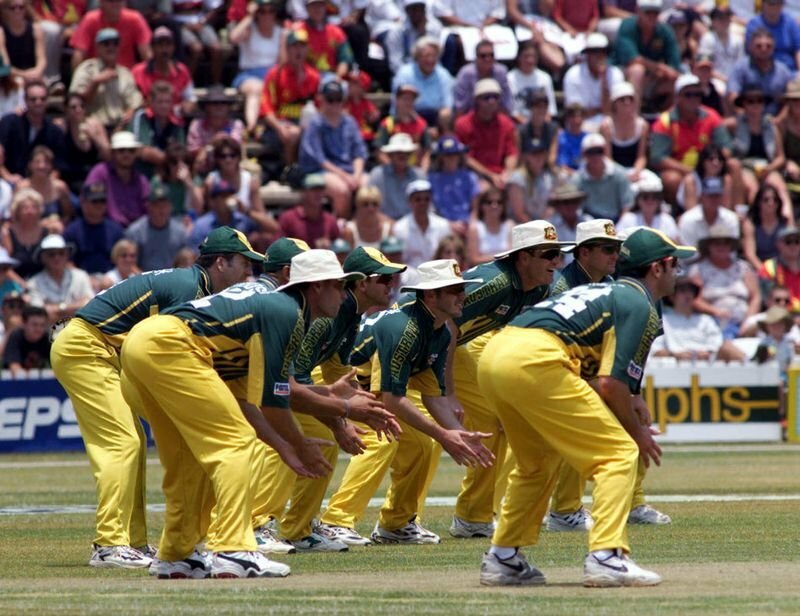 The Aussies completed the treble by winning World Cups in 1999, 2003 and 2007. 25. Chris Gayle bows down to AB de Villiers' fastest ODI century off just 31 balls. 26. Yuvraj Singh touches the feet of his idol. Sachin was the captain of the MCC team and Yuvraj played for the Rest Of The World team. 27. 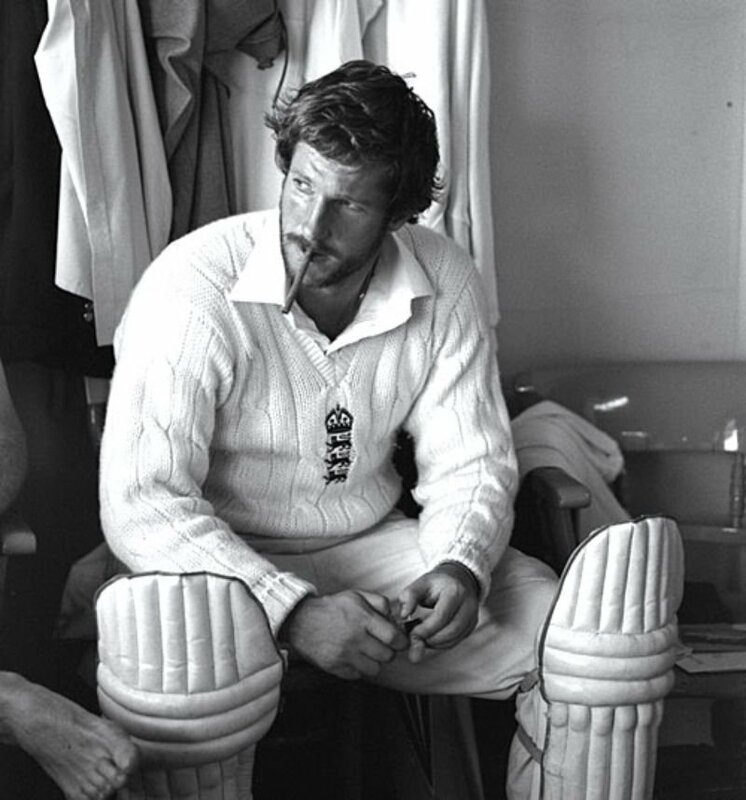 Tribute to the charismatic late Tony Greig for his amazing contribution to the game. 28. The moment a billion hearts were waiting for. India lifting the 2011 World Cup. 29. Malcolm Marshall batting at No. 11 with a fractured hand. Marshall came out with a broken hand to help fellow teammate Larry Gomes who was at 96. Gomes completed his century and Marshall managed a boundary. He also took 7 wickets for 53 runs. 30. 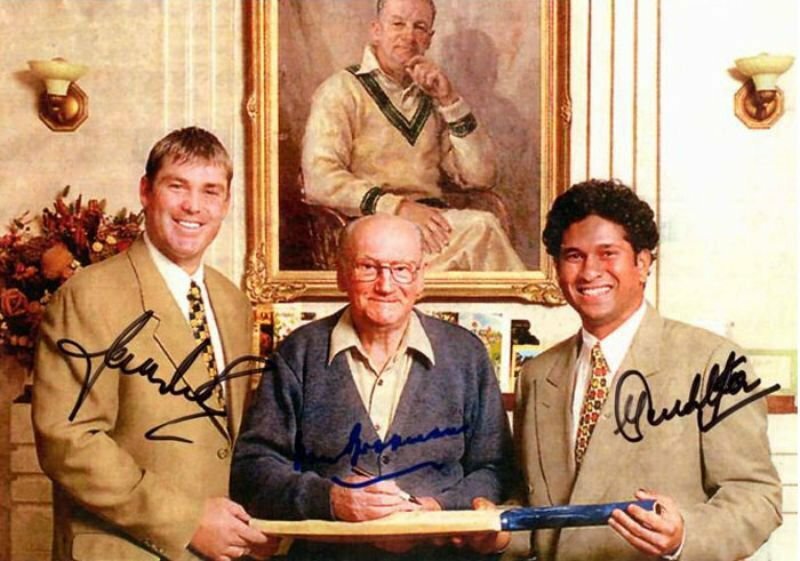 Three men cricket can never forget: The Wizard, The Don and The Little Master. 31. 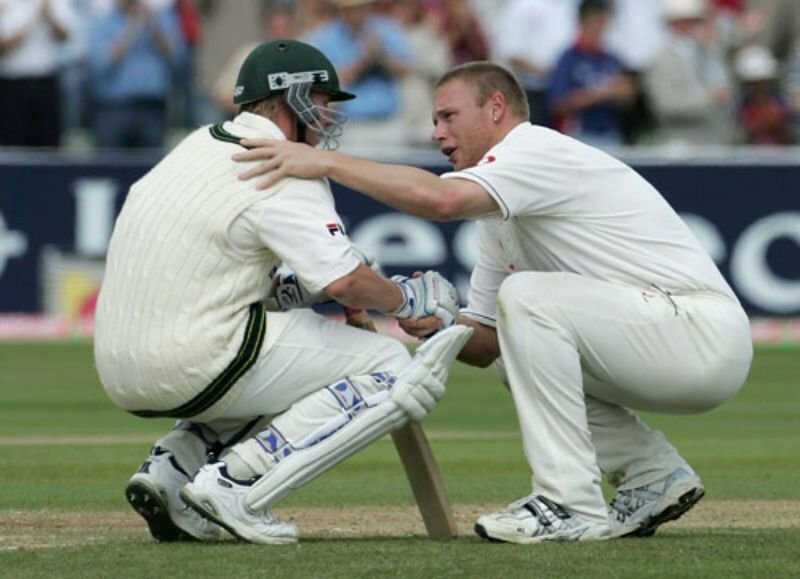 Freddie Flintoff shows the spirit of the game as he consoles Brett Lee after England won by 2 runs. 32. 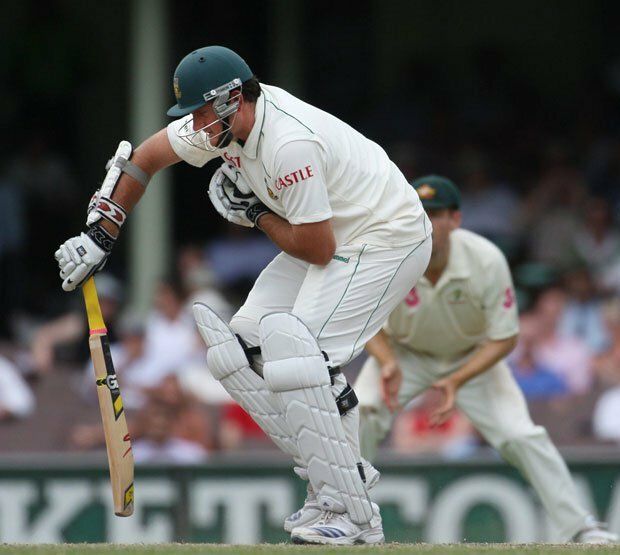 Heroic captain Graeme Smith comes out to bat with a broken finger. South Africa needed to play out 8.2 overs to draw the match against Australia and Smith tried his best. Even though they lost, his effort was commendable. 33. 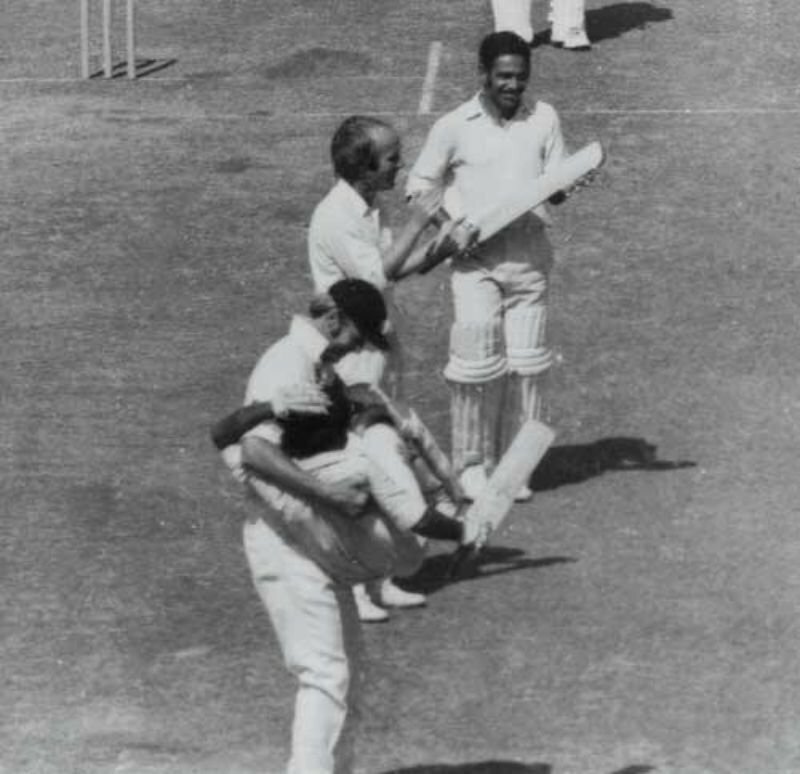 Tony Grieg cradles Gundappa Vishwanath like a baby after Vishwanath scored a century. 34. 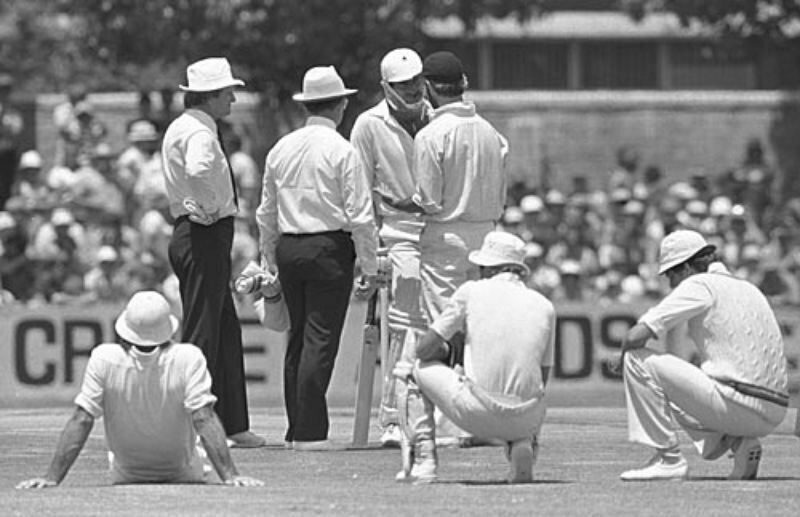 Mike Brearly holds up play as Dennis Lillee comes into bat with an aluminium bat called the ComBat. 35. 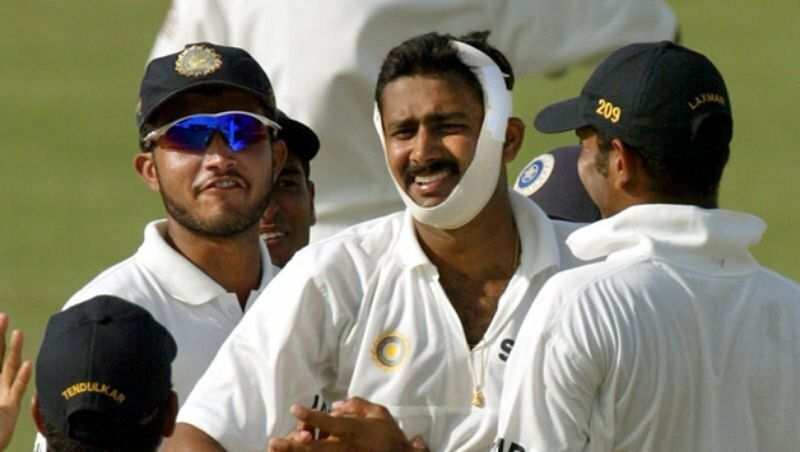 Anil Kumble came out to bowl 14 consecutive overs with a broken jaw in Antigua, 2002. 36. 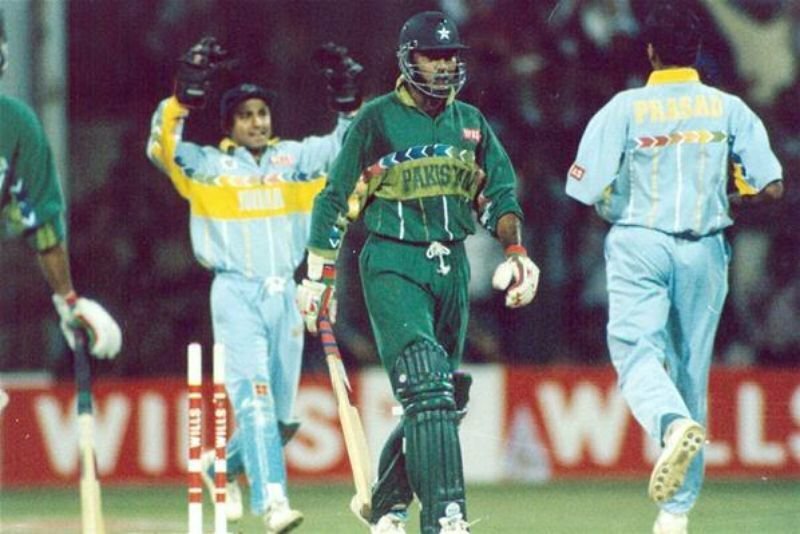 Aamir Sohail mocked Venkatesh Prasad after hitting a four in the 1996 World Cup quarterfinal. And Prasad dislodged his off stump on the very next ball. 37. Sachin Tendulkar finally reaches his 100th century. 38. 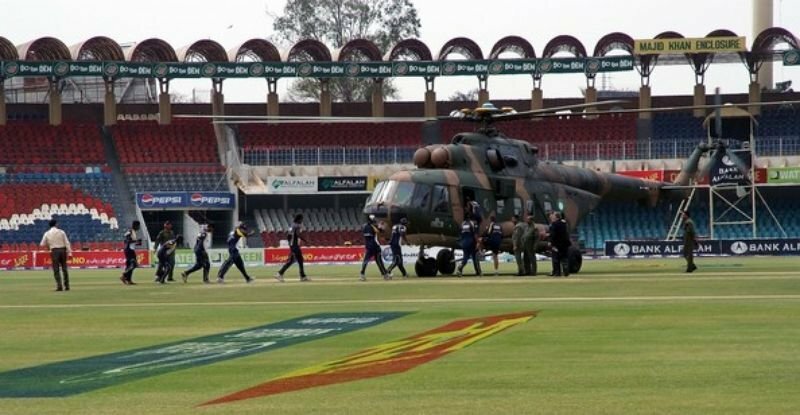 The Sri Lankan cricket team being airlifted from Gadaffi Stadium, Lahore in 2009 after a terrorist attack which left several players injured. 39. 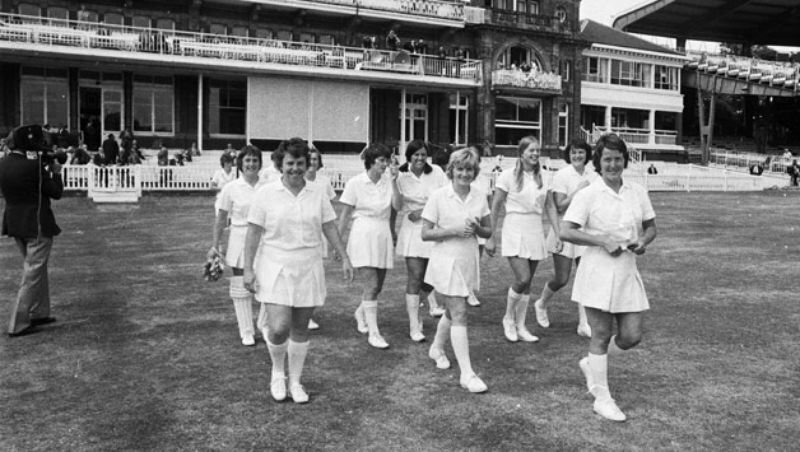 The first women's ODI match to be played at Lord's on 4th August 1976. 41. 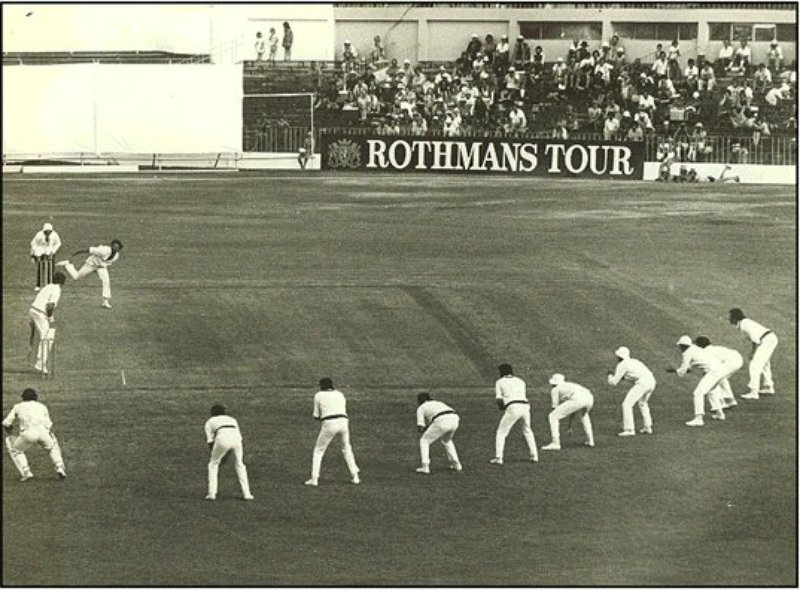 One of the best Indian fielders in history, Eknath Solkar takes an amazing catch to dismiss Alan Knott at The Oval in 1971. 42. Bermuda's Dwayne Leverock's spectacular diving catch at slip to dismiss Robin Uthappa at the 2007 World Cup. Keppler is one of the few players to play for two countries. He had played 24 Tests for Australia but after the ban from South Africa was lifted in 1991, he was chosen as captain and scored 81 not out to beat the Aussies in the opening game of the '92 WC. 44. Two legends of the game separated only by time. 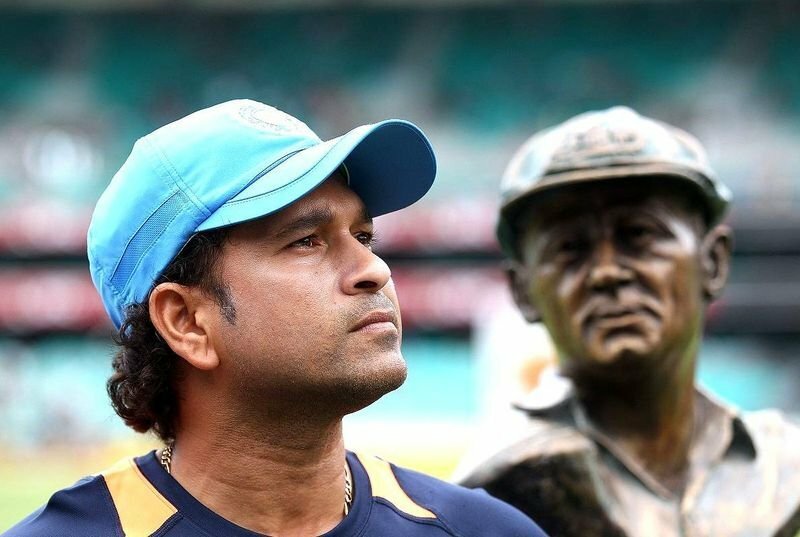 Sachin Ramesh Tendulkar in front of Sir Donald Bradman's statue. Here we have provided various apps by which singles find their dates online by filtering out the preferences and make the love happen. We are strict in a matter of user privacy, the messages which are provided are encrypted is only readable to our users.